Over the past few years we have seen some huge innovations in the basketball gear marketplace. 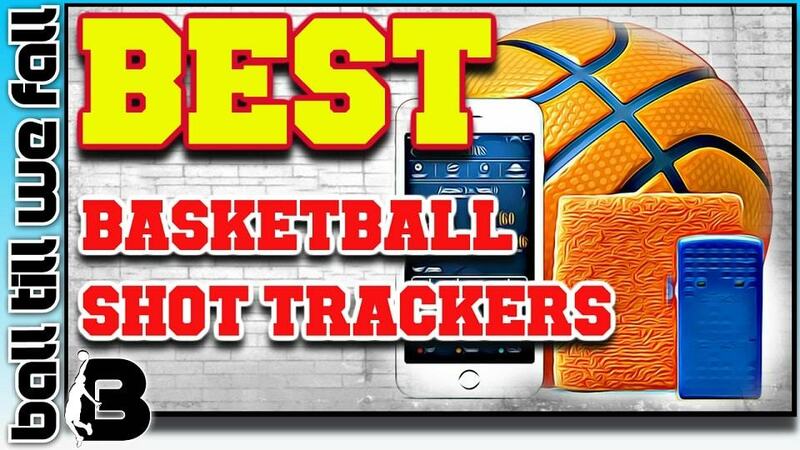 Some of the greatest basketball inventions of late have come in the form of basketball shot tracking apps, dribbling equipment and smart basketballs. 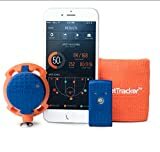 These new age shot tracking products are perfect for basketball players who like hard data and are hellbent on improving shot form and performance. If you take your game seriously, owning a shot tracker can be a great way to help take your game to the next level. They can also be a lot of fun! 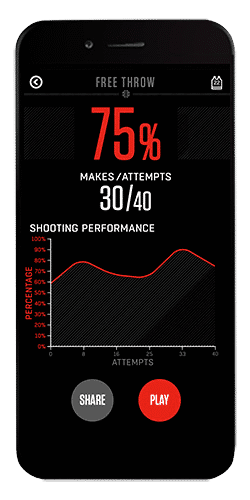 We hope you enjoy our Shot Tracker reviews and find them helpful in allowing you to better understand exactly how they can help you become a better shooter. Join me as I roundup, compare and review the Best Basketball Shot Trackers and Basketball Shot Counters available. Apparel/App Partnered & Net Shot Tracking Sensors - Currently the most accurate method available. 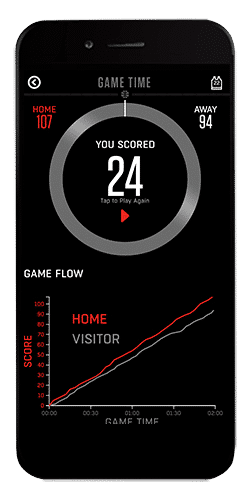 This is also the most popular method thanks to the success of the groundbreaking technology incorporated into the ShotTracker device and partnered app. Learn more about ShotTracker here. Internal Sensors Within Ball & Partnered App- There have been a few attempts at adding in built shock tracking sensors to basketballs. However only recently has a company succeeded in creating a smart basketball that will allow you to track your shots accurately. The Wilson X is definitely worth checking out if you are interested in a shot tracking smart basketball. ​"To get where you want to be, you have to train with game time intensity all year long. 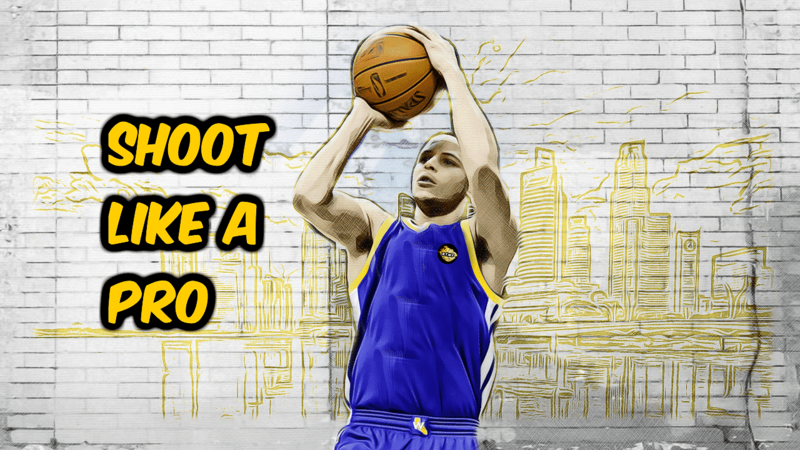 ShotTracker helps players do this and holds them accountable" Klay Thompson, NBA Champion. In my opinion, the original ShotTracker is by far the best basketball shot tracking device currently available. The team at ShotTracker have spent many years developing and perfecting this device to get it to solid product that we can purchase today. The ShotTracker has been very well received with many users leaving very positive feedbac﻿﻿k. 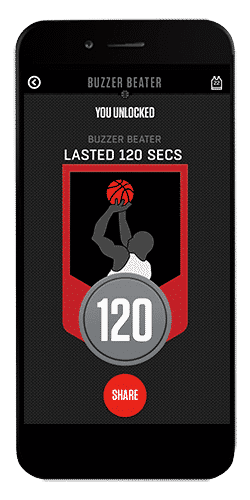 In fact this product has been so well received that the NBA Commissioner and Magic Johnson have invested 5 ﻿m﻿illion dollars into bringing a team version of this device to the NBA to track real-time game analytics. The technology included in this product is simply groundbreaking. However in saying that, the process of using the shot tracker is very simple. 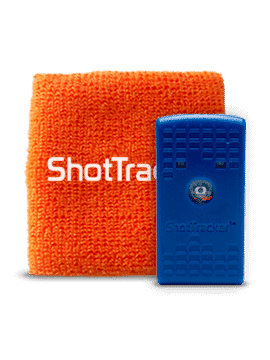 To use the shot tracker you simply load up the app, connect one sensor to the net and then slip on the wrist band with built in sensor (or alternatively you can separately purchase the ShotTracker Shooting Sleeve). Note: Works with any outdoor and indoor basketball. The basketball ShotTracker net sensor is very easy to attach to any basketball hoop net. This is the device that registers shot makes or misses when working together with the wrist sensor. The basketball ShotTracker wrist sensor simply slips inside the included wrist band. Here the sensor links with the net sensor and app via Bluetooth to track your shooting results. 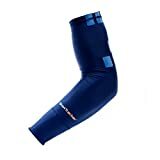 The basketball ShotTracker arm sleeve can be purchased separately. This arm sleeve simply replaces the wrist band that is included in the package. Learn why ballers wear basketball arm sleeves . 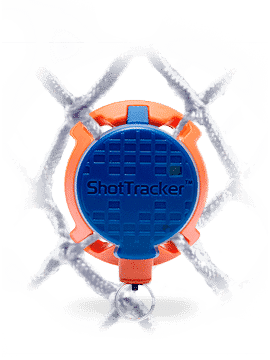 During our ShotTracker review we were very impressed by the additional shooting programs, workouts and fun games that you can play with the shot tracker. Yep, this is much more than a simple shot tracker. Unlike many other shot tracking apps that have come before, the app partnered with this system is rock solid. It can track statistics like shooting charts, percentages, time and all other kinds of helpful data. This device is going to put a lot of basketball personal trainers out of business. If you want to learn how to shoot a basketball like a pro then this is the device to help you improve your accuracy and consistency. There are a ton of drills and instructional videos to accompany the included programs on the app. We love the fact that you can also compare your stats with other users and professional athletes. We can't fault this amazing product. It is that good! "The Wilson X is the smartest basketball money can buy. 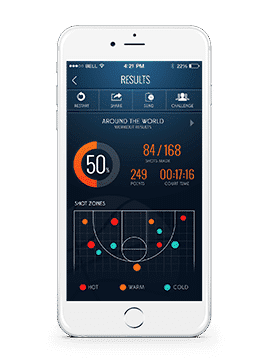 It will track your shots plus provide hours of competitive fun with the inbuilt shooting games"
The Wilson X basketball is the smartest basketball ever invented. Hence why we rated the Wilson X the Most Innovative Basketball Of The Year in our roundup of the best indoor basketballs. This state of the art basketball shares the same premium quality we have come to expect from Wilson. It is regulation size and weight, has excellent grip and is extremely durable. Yes, it can also be used as an outdoor basketball. The ball can be used on any standard 10ft rim with a net. Although we think the ShotTracker is a much more polished device, charging on that device can become tedious. We love the fact that the Wilson X never needs charging. 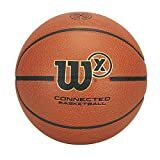 Yep it will run for over 100,000 shots via it's Bluetooth connection with the Wilson X App (Android and Apple). You don't need an active internet connection to use the ball once you have downloaded the Wilson X app. The sound effects used on this device is also a very cool addition that is not included on the ShotTracker. Hearing the crowd noise, countdowns, horns and other effects really makes this a fun ball to use while working on becoming a bett﻿er shooter. ​Note: You will have to buy a new Wilson X after the battery runs out. However, the Wilson X comes with a non-rechargeable battery that’s good for measuring about 100,000 shots. That’s 300 connected shots a day, 5 days a week for a whole year. If you manage to wear out the battery you will probably be a big baller and can probably afford a new one anyway. 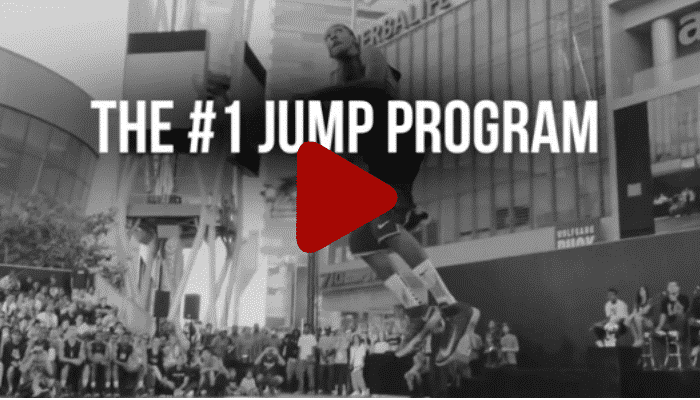 "Amplify your basketball game with Blast Basketball. 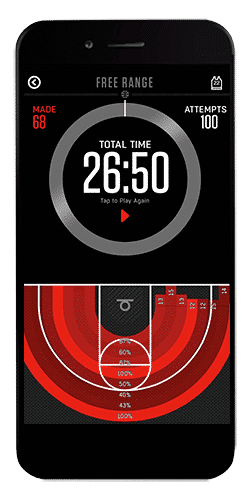 Fire-up the Blast app’s BlastCam to record video of the action and the patented Smart Video Capture ™ technology will dynamically identify high-energy events to create Blast highlights, overlaid with your basketball metrics (acceleration, vertical height, rotation, and hang-time)." As you can see there are only really 2 quality basketball shot counter and trackers on the market. The original ShotTracker and the Wilson X. Personally, I prefer the ShotTracker as the entire system and partnered app seem a little more polished. The training programs on the shot tracker are much more detailed, hence if performance is your goal I would choose this option. You can purchase the ShotTracker HERE. However, if you just want to simply put some shots up, track your progress and have some fun while doing so the Wilson X is a great choice. The sound effects add an extra element that is very fun, particularly for children and teens. You can purchase the Wilson X HERE.